Zee & Co have been trading as a designer fashion brand retailer for over 30 years. They work with hundreds of different top quality brands to bring only the finest clothing to market. With stores located around the UK and a vibrant and expanding website, Zee & Co are well placed to look after your fashion needs. If you are looking for a store to visit, they are heavily located in the South-East of England. Zee & Co have always try to delivery great value and unbeatable prices over the years. Zee & Co will from time to time offer 10% off voucher codes, a flat discount on all orders. If you are looking to spend on a large item then they will offer a larger £15 off voucher only if you spend over £150. Popular brands that are sold at Zee & Co include Stone Island, CP Company, Hugo Boss and Barbour. All of which can be found at heavily discounted prices. 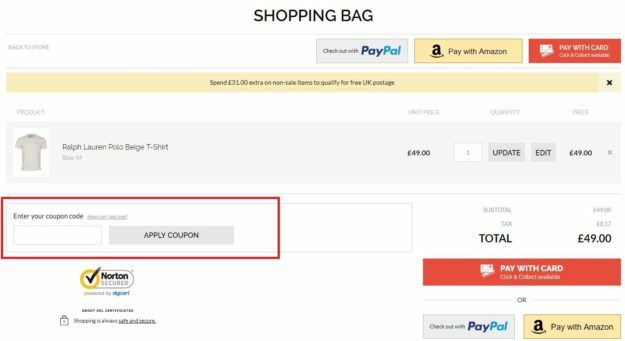 Don't forget, we have created a video that you can view below on this page that shows you visually how to add a discount code when shopping at Zee & Co. Looking for Student Discount with Zee & Co? Unfortunately Zee & Co do not offer student discount. If this changes we will update this page accordingly. Have a question about a fashion brand or delivery enquiry? Zee & Co's customer care team are on hand to help. Details are below. Zee & Co sell the latest luxury designer clothing from some of the most popular fashion brands around the world. The likes of Stone Island, CP Company and Hugo Boss are just some of the huge brands available online. Use our Zee & Co voucher codes and discounts to help you save as much money as possible and to guide you in the right direction of the best savings.